This sweet little girl below is turning ONE this week. What an important birthday! To emphasize the importance of such a wonderful day I thought it was only fitting that this little princess ought to have a crown. Here's what I came up with, and guess what? I actually have the PATTERN done and posted below! No waiting this time! I got the original idea from these darling crowns from this etsy store. 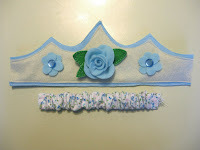 Because my crown follows Rubyellen's so closely, I ask that you only use this pattern for personal use. Sorry, no selling. One thing that I wish I could have done was to add darling decorative stitching to the bottom of my crown like Rubyellen does. Alas, the decorative stitches on my little Kenmore are limited. Click on the thumbnail picture below to open up the pattern file. You will need Adobe Reader to see and print it. It's free, and you can download it here. 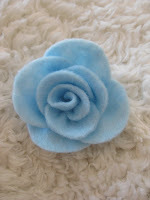 1.Cut rose center, petals, small flowers, and crown backs out of light blue felt. 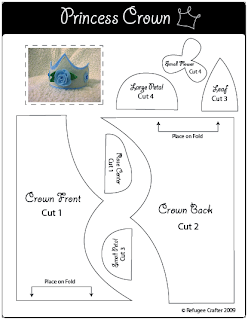 Cut crown front out of off-white felt and leaves out of green. 2. Roll the rose center starting at the small end and rolling toward the large end. Secure with a few stitches through the bottom. 3. 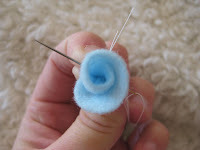 Stitch along the straight edge of each petal and pull thread tight to gather. Secure thread. 4. 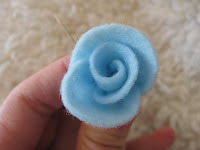 Stitch petals to the rose center along the bottom starting with the three small petals. Overlap the edges of the petals as you go. 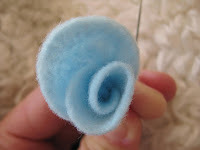 When you finish, you may want to fold over and out the edges of the large petals to give it a more realistic rose look. It kind of softens the whole rose. 5. 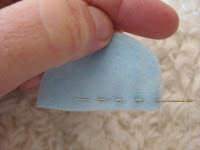 Stitch along the straight edge of the leaves and pull the thread tight to gather. Secure thread. 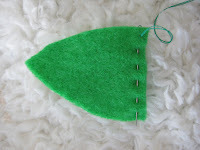 I did the following to soften the bright green color of my felt and add a little detail, but it is totally optional. Looks great without it. 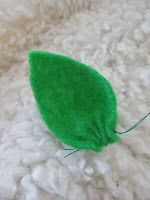 I sewed along the edges of my leaves using a blanket stitch. 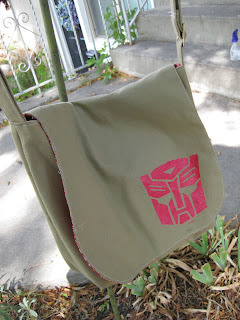 I also sewed along the middle using a running stitch. That's all. 6. 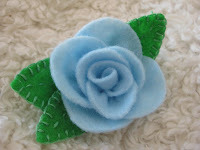 Stitch the leaves to the bottom of the rose. 7. 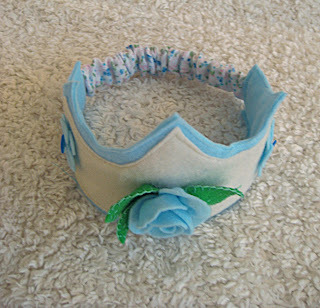 Sew the rose to the center of the off-white crown front. Place one small flower on top of another below the other two crown peaks, rotating the top flower so that all six petals are showing. 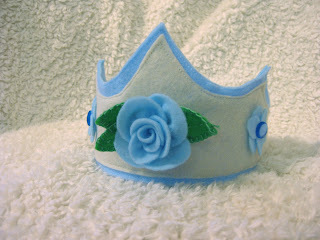 Secure to each other and the crown front by sewing a button through the centers. 8. Center and sew crown front to one blue crown back about 1/8" from the edge of the off-white crown front. 9. Sew remaining blue back to, well, the back. Again about 1/8" from the edge leave the short sides unsewn so that the elastic piece can be inserted in and sewn in place. 10. Fold the 3 1/2" x 16" flannel piece in half, right sides together. Sew along long edge about 1/4" from the edge. Turn inside out. Insert 8" piece of elastic inside securing at both ends. 11. Insert flannel covered elastic piece ends about 1/2" or so into the open short sides of the crown and sew in place to complete the crown. Be sure elastic is not twisted before you sew it in. I love your blog. I hope you don't mind that I linked your tutorial from my blog. If it's a problem let me know. What a darling crown. I thought it wasn't loading, but it just took a while. Definitely worth waiting for! 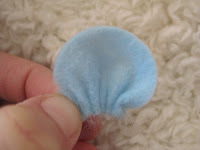 Did you use wool felt, or just felt that you can find at a craft store? Thanks! I just used the "el cheapo" felt from a craft store...the 20 cent 9x12 sheets. I love your crown. I've just made one for each of my daughters. Your instructions are really clear and easy to follow. 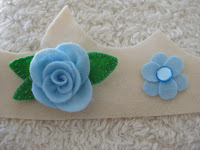 I was amazed how simple the rose was and how strong the attachement to the crown feels. I've linked you on my blog. I just made my daughter a crown for her birthday on Tuesday and it is absolutely beautiful. Thank you so much for posting this tutorial. 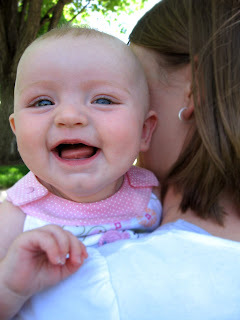 When I blog about her birthday on Tuesday I will be adding a link to you. Thanks again! Thank you so much for this great tutorial! I was able to whip one out in time for my two year olds birthday party this past weekend. I put a link to your tutorial on my blog post! Thank you again for taking the time to post this for all of us! Superb! I got inspired by you and I made my princesses their own birthday-crown. Result you can see here! could you possibly email it to me at wcrosby2004@yahoo.com if you have it?